Which breakout fantasy football performers from 2018 are set to regress in 2019, rather than build on their impressive 2018 campaigns? This article will highlight some of the most out-of-nowhere performers from last season that will be viewed as “one-hit wonders” by this time next year. Okay, so, “one-hit wonder” might be a little harsh — most if not all of these players will still be viable fantasy options moving forward — but the point is they won’t build on their 2018 performances. Got it? Good. In order to make this article actually interesting, I’m choosing players who were legit fantasy starters in 2018. 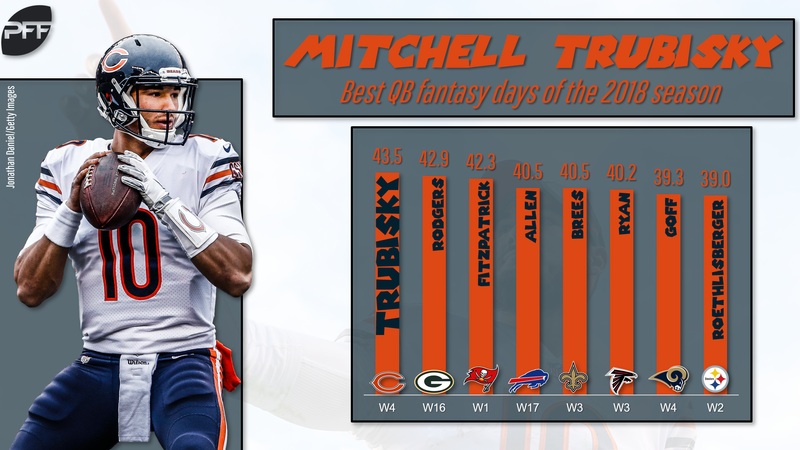 Trubisky finished the year as the No. 15 fantasy quarterback, and even though it wasn’t consistent production, he did have some week-winning games. The fantasy scoring was largely born from his legs, as Trubisky rushed for 421 yards, fifth-most among quarterbacks. As a passer, however, Trubisky still has a long way to go. He threw for only 3,223 yards (16-game pace of about 3,680) and 24 touchdowns — six of which came in a single game. His PFF passing grade of 56.5 ranked 35th out of the 44 quarterbacks who had at least 100 dropbacks. Next year will only be Trubisky’s third in the league, so he is of course still young with time to grow, but his rushing production isn’t bankable and his progression as a passer will be incremental rather than exponential. There were times in 2018 that you were able to confidently plug Trubisky into your fantasy lineup. Those won’t exist in 2019. Don’t get me wrong: White will still be fantasy relevant in 2019 (and beyond). He has been a consistently great pass-catcher for the Patriots for four straight seasons, and he took on an expanded role in the rushing game in 2018 with 425 rushing yards and five touchdowns. For comparison, from 2015 to 2017, white had 393 rushing yards and two touchdowns. The big year saw White finish as the No. 7 running back in PPR leagues. There were a few weeks where he was one of the most expensive options in DFS — and it wasn’t even a bad move to pay up for him. But let’s also remember that rookie Sony Michel was injured for much of the season, as was Rex Burkhead. Michel dominated rushing attempts down the stretch and made the most of those opportunities, so you know he’ll be back in that role — perhaps in an even more expansive way — in 2019, while Burkhead’s returned also ate into White’s usage. Simply put, White won’t be a fantasy RB1 in 2019. His 12 touchdowns last year were more than he had scored in the last two years combined (eight). Combined with his outlier year as a runner, all signs point to regression for White moving forward. Lindsay didn’t top 20 rushing attempts in any game, and there wasn’t that much to write home about through the air (16 yards per game). Royce Freeman is still a factor, too. Lindsay had eight attempts inside the five (he scored on five of them), but Freeman also had five (he scored on three). The Broncos are still devoid of quarterback talent — yes, even counting the Joe Flacco trade — and the team’s best outside threat, Emmanuel Sanders, will be 32 and coming off a December Achilles tear. I think a middle-of-the-pack RB2 season or flex option is in the works, and I don’t think he improves on his rookie season, which saw him top 1,250 total yards and 10 total touchdowns. Those will be hard numbers to top with increased competition from Freeman and an offense moving backward all around him. Woods was awesome in 2018. He was the poster child of consistency, with at least four receptions and at least 60 yards every game Week 2-16, with six touchdowns in that span as well. It was good enough for Woods to put up a tail-end WR1 fantasy season. The problem is, that kind of streak is really rare. 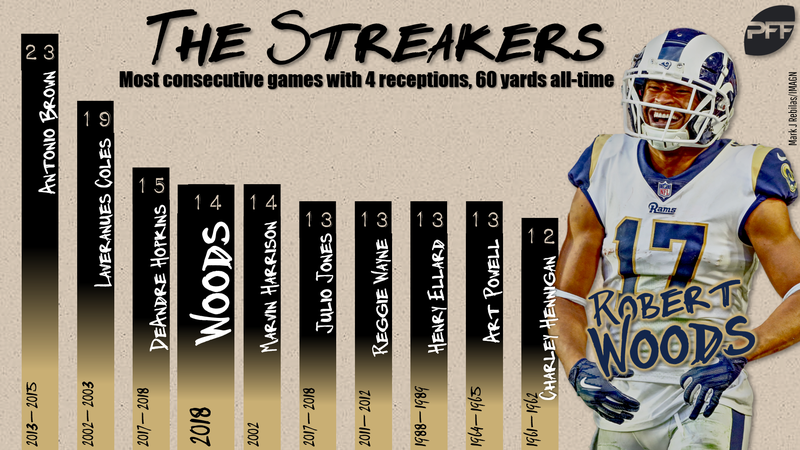 Only Marvin Harrison, DeAndre Hopkins, Laveranues Coles (ha), and Antonio Brown have gone at least 4-60 in as many or more games in a row than Woods. The players who have produced at least two seasons in a row with at least 85 receptions, 1,200 yards, and six touchdowns is riddled with Hall of Famers or very, very, very good players. Not to take anything away from Woods, but his name would be the clear outlier on this list. Boyd smashed throughout the entire 2018 season, with 76 receptions, 1,028 yards, and seven touchdowns. He was even solid down the stretch with A.J. Green and Andy Dalton sidelined. Of all the names on this list, this is the one I’m least confident in. He’ll still be just 24 when next season begins, Green’s time as a dominant force is drawing to a close (which opens the door for more Boyd), and the Bengals could (hopefully) upgrade at quarterback in the next few seasons. So why am I calling him a “one-hit wonder”? I think high-end WR2 — like the 15th-place overall he produced in 2018 — is about as high as it gets for Boyd. He has an extremely low average depth of target of 9.56 yards, which ranked 95th among qualifying receivers this year. He would need a JuJu Smith-Schuster-esque 150-plus targets to put up consistent WR1 numbers with that aDOT. Boyd’s points per snap ranked 20th, too, so he was a solid WR2 in terms of scoring efficiency as well. Boyd can definitely reach his 2018 heights again. I don’t think it gets better, though. Cook had the rare 10th-year, age-31 breakout season. So, there’s your first red flag. He set career high across the board: targets (99), receptions (68), yards (896), touchdowns (6), and catch rate (67.3%). He had four 100-yard games and finished as the No. 5 tight end in fantasy. The issue with Cook is that his 2018 season doesn’t erase his 2009-2017 campaigns. Can he be good? Of course. We saw it in the playoffs when he was with the Packers, and we saw it through most of 2018. But I’m more willing to bet on Cook’s career than his most recent season. Another issue with Cook is that his 2018 campaign was literally his ceiling. It’s not going to get better. If we take the best-case scenario and assume he repeats his 2018 stat line, we must also remember that the 2018 tight end class was devoid of talent except for a few elite players. Other tight ends who disappointed or were injured in 2018 — such as Rob Gronkowski, Hunter Henry, Evan Engram, O.J. Howard, Greg Olsen — should return in 2019 to make the position more competitive and reduce Cook’s relative value.